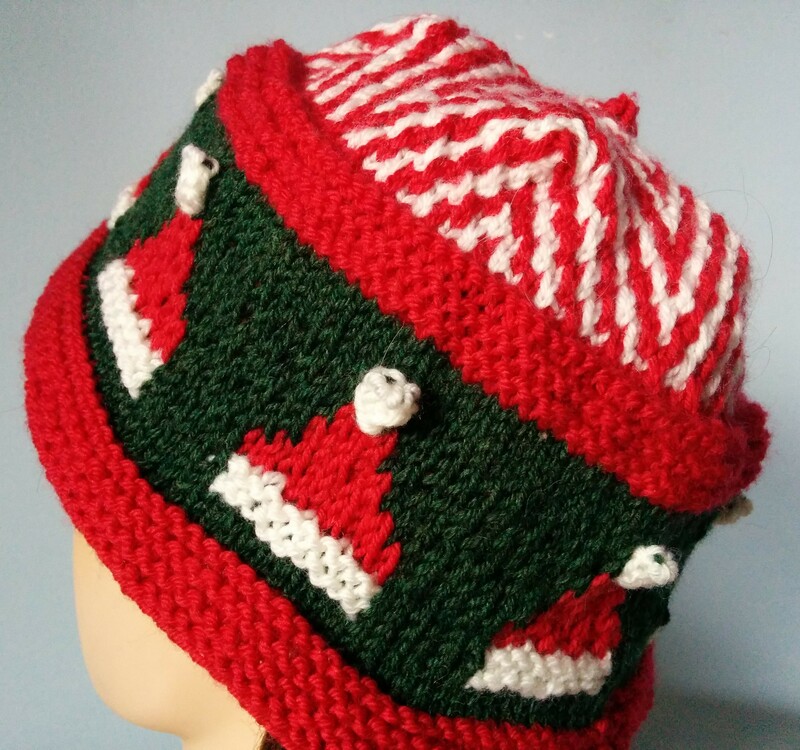 I am looking forward to Christmas and so I guess I am happy to be doing some Christmas hats. I started this blog when I was on a run of Halloween hats. It seems like a lifetime ago, and I guess it is for some toddlers I know. Who are coming to my Mum’s for Christmas. Yeah. As well as my own grown up babies. Yeah. And all 6 of my sisters. Yeah. And my brother. Yeah. Speaking of my grown up babies, we skyped Jacob the other day and he has a moustache. He still had his movember moustache. He has been wanting to grow one since movember started, and now he is old enough. Sigh. He will be coming home on Christmas eve, then we will head for Mum’s. He is working in silicon valley down in the states for a year as an intern. He has been gone since May and it is a long time. He hasn’t lived at home since he started his engineering degree three years ago, I had gotten used to this, but out of the country is another ball of emotional wax. I think this is a cool hat. I am constantly amazed by how the next stitch works out. At least I am often pleased with the results. I am never quite sure in my mind if I am what one would call a designer or not. I just go to the next stitch, cast on what seems like a reasonable number of stitches and go from there. If I run into problems, I wing it. I have done enough hats now that I can usually turn things around. I tend to cast off and pick back up rather haphazardly in working things out. I had to use a multiple of 24 for the Zebra Chevron, pg 69, so it was either 96 or 120. 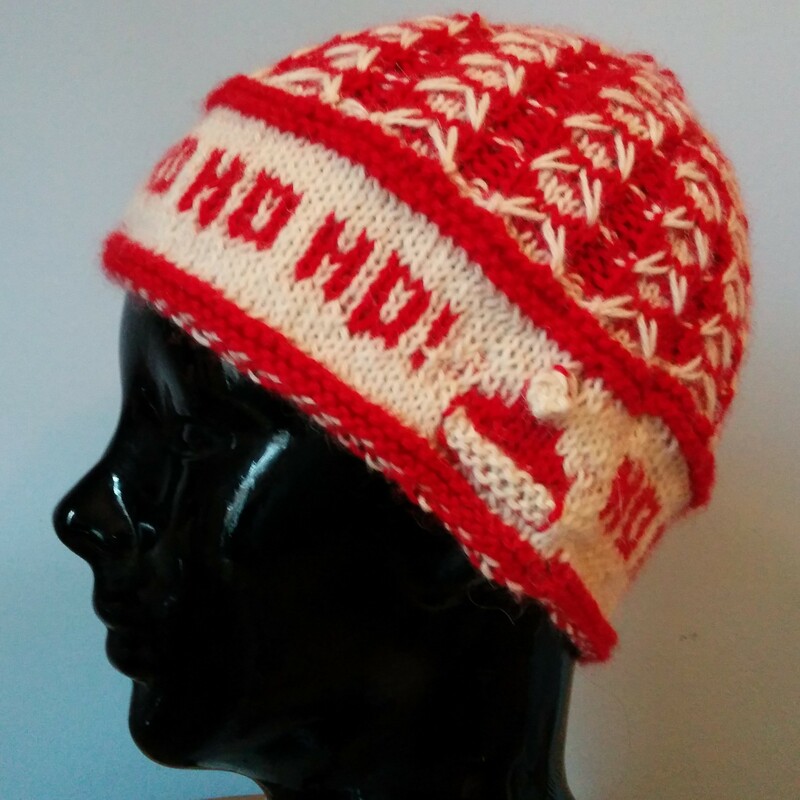 I switched to a new yarn for this hat, Cascade 220 superwash. I went to my favourite all time wool store, Romni Wools, when I was in Toronto and the helpful young woman suggested it. I read the ball band and it said you could use 4 or 4.5 mm needles, so I went with 4 mm and cast on 120 stitches, like I had been doing for the alpaca. I thought this was going to be the main body of the hat when I cast on. 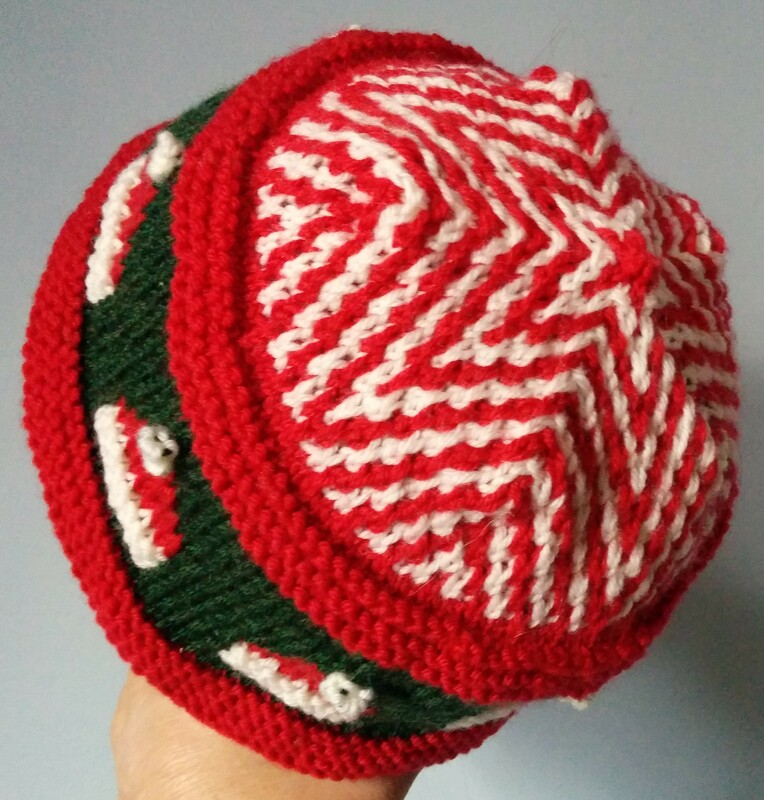 Again, swatching may have helped, but in this case I am not sure I would have ended up with as good a hat. 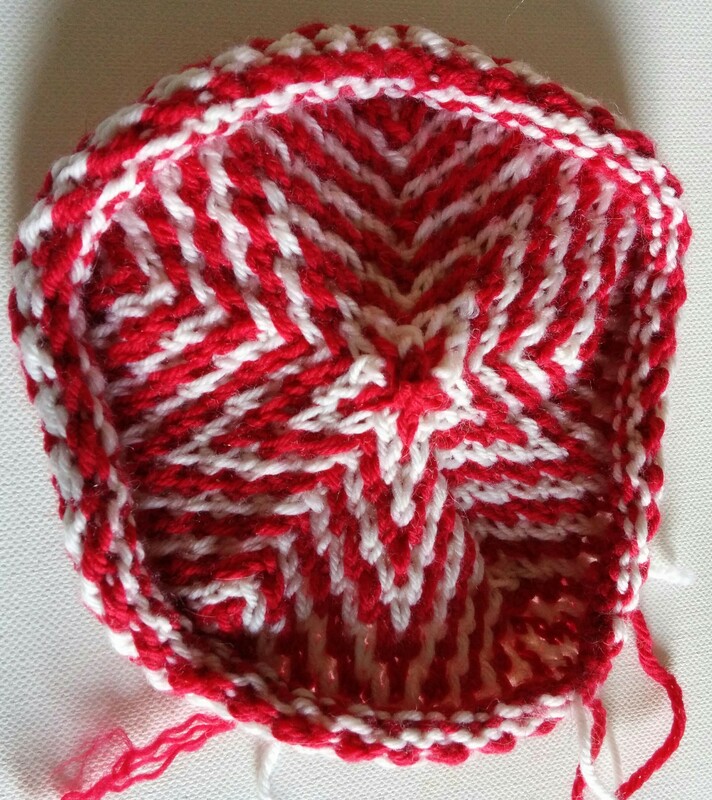 It became apparent after one and a half of the 12 row repeats that this was probably going to be too tight. 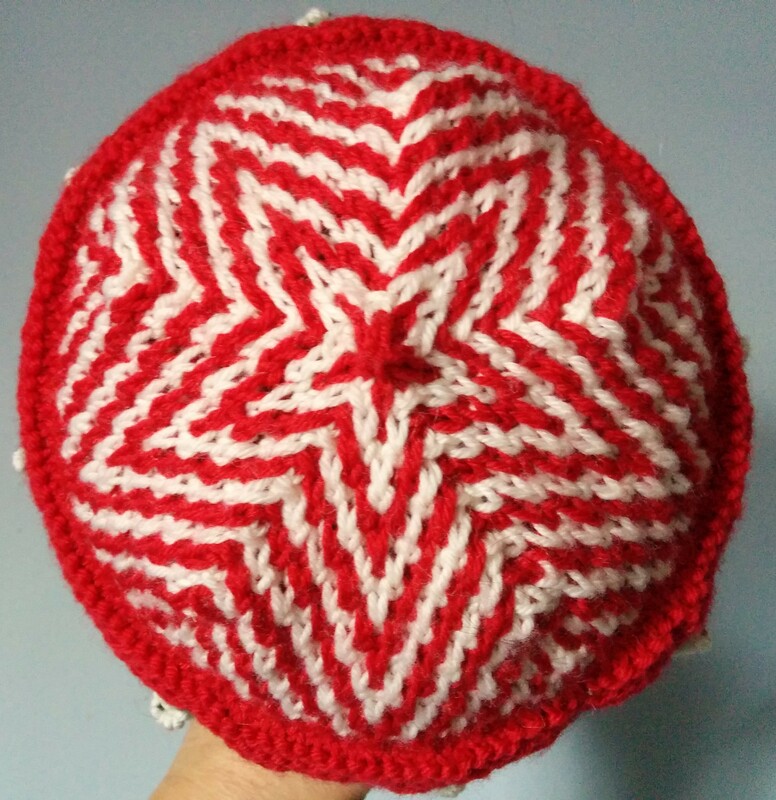 It had already been quite a bit of effort, so rather than start again, I decided to make it the crown of the hat instead and got rid of the stitches at five points of decrease (slip one k2tog, psso at the top of each chevron every other row). Because this was pretty aggressive decreasing, it gave me a lovely sculptural top. And graphic as all get out to boot. Like a red an white mountain range. I felt at this point that the 4 mm needles were making it too tight for my liking, so when I picked up from the original cast on edge, I did so with a 4.5 mm needle. I did 6 rows of garter stitch before switching to green for the pattern band. These are pretty much the same Santa hats as I put on the ho ho ho! hat. They work better on the green ground, which I knew they would, but then again, I didn’t own green alpaca. 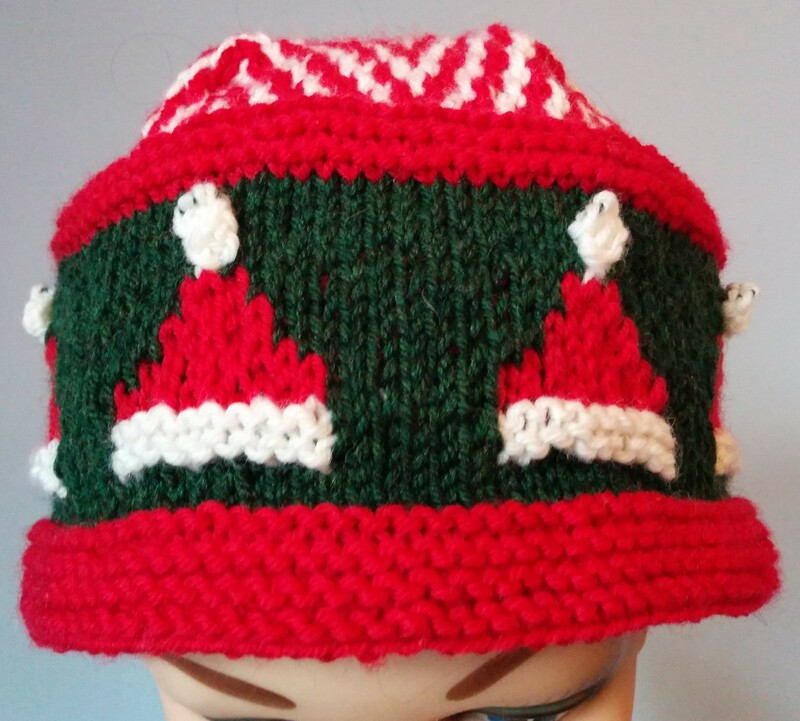 They also work better when knitted upside down like this because the bobbles sit in a better position on the top of the hats. I finished off with 8 rows of garter stitch, then used the Elastic Bind Off from Cast on, Bind off by Leslie Ann Bestor. Which, by the way, i am going to ask for for Christmas. I must say, I am totally sold on the strategic use of different cast on/offs. I am less thrilled with this yarn. 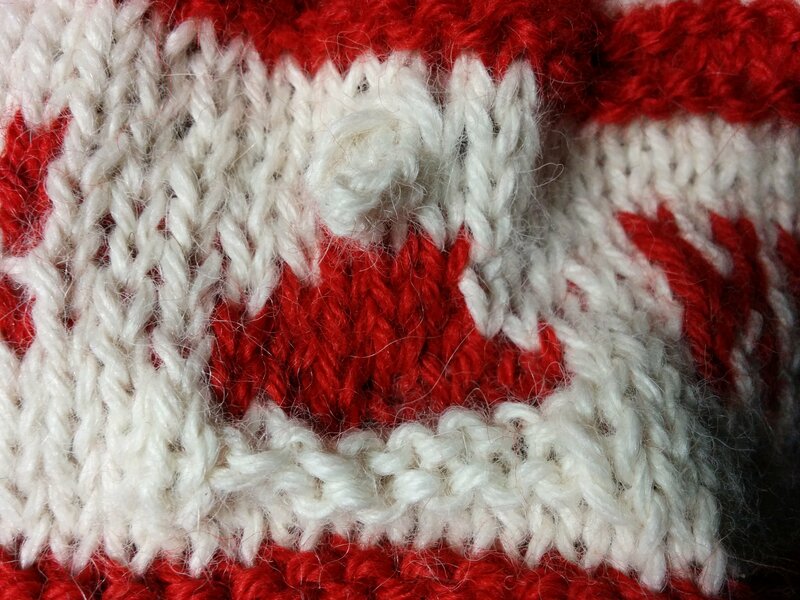 It is 100% wool, but it does not seem to be made from particularly fine wool and feels almost synthetic to me. 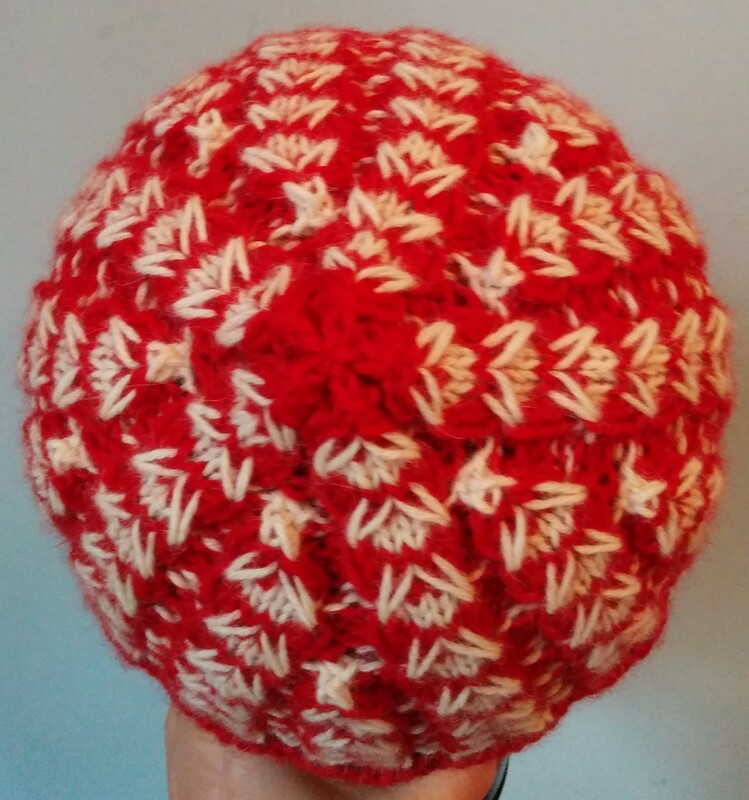 Maybe it is just that the last dozen hats i made were with lovely soft alpaca. I had become less enamored with my Patons Classic Wool because I felt it was becoming more harsh, but I feel like I may have fallen out of the proverbial frying pan here. 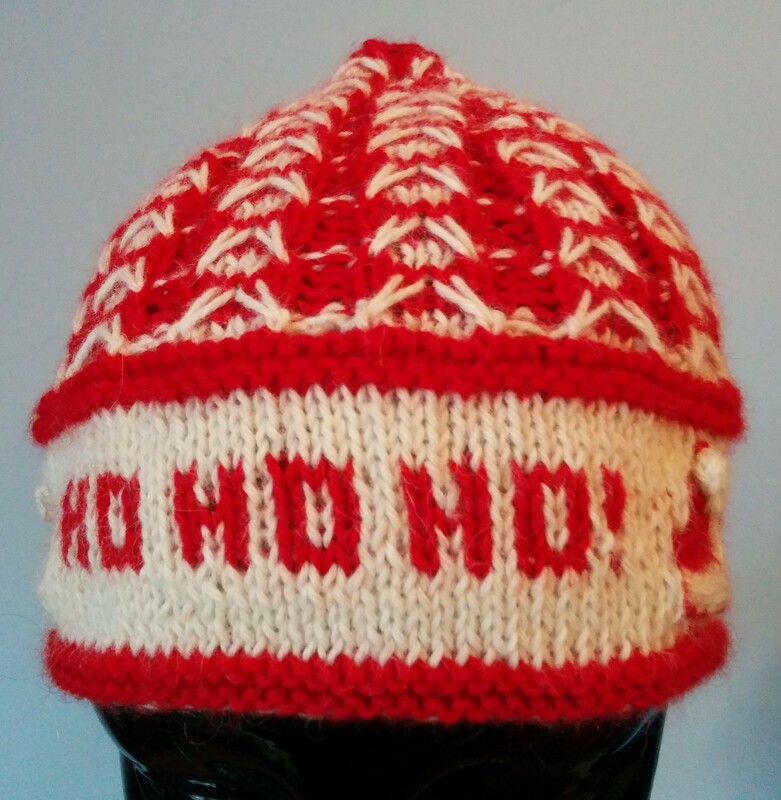 This entry was posted in Barbara Walker and tagged A Treasury of Knitting Patterns, Barbara Walker, Cascade 220, Cast On Bind Off, Christmas, Christmas hat, knitted hat, Leslie Ann Bestor on December 8, 2015 by gillianknitter.